Welcome to the Hidden Dunes Beach and tennis resort. Great location: on the beachside of Emerald Coast Parkway (98) (no roads to cross for beach access), just a half mile east of the Silver Sands Factory Outlet Stores! Lushly landscaped, 27 acre gated resort! Fountains, enormous swimming pool, plus second heated pool (seasonal)! 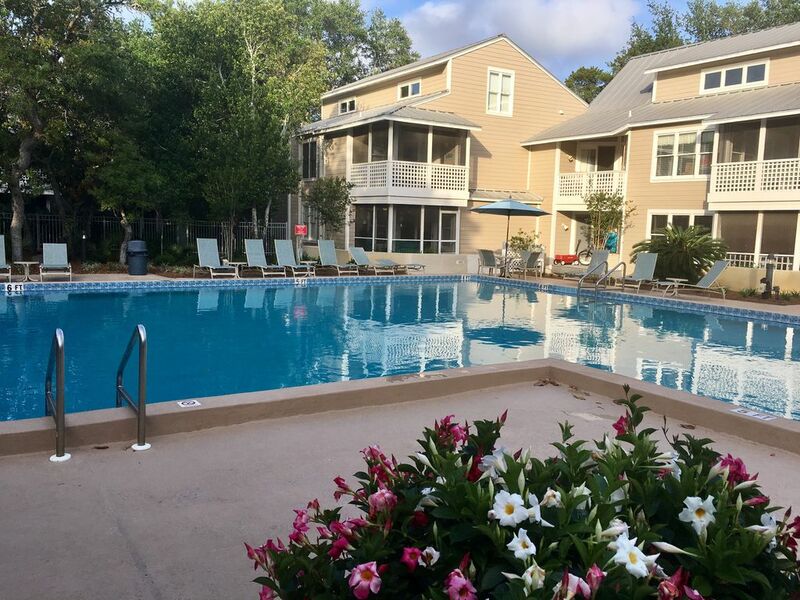 Hot tubs, playground, tennis center with six rubico clay courts with a full-time teaching tennis pro, and an assistant who is also a licensed massage therapist! Basketball court! Snack grill/bar near the beach (seasonal). This was our 2nd time staying here and it was just as wonderful as our first stay. Love being so close to the pool and the unit is clean and very well equipped. My only recommendation might be to freshen up the patio furniture in the screened in porch. The cushions are getting a bit thin on the metal furniture so maybe not as comfy as they could be. The weather was great and the beach just perfect. The pool was cold but we learned that the other pool in the complex is heated. Thanks again for another great spring break. Access to pool was right out our screened in porch. Weather was great. Beach access was farther than I realized and you had to pay for chairs. Well kept and so close to the pool. We had a fantastic time while in Destin. The condo was in a great location. Condo was conveniently located and very nice place. Had everything that was needed. We had a wonderful time and will definitely visit again! Fantastic time had by all! We enjoyed every minute here and were quite surprised at how well stocked the kitchen was. Pull out sofa was not as bad as we were worried it might be and we loved the lenai. Only suggestion would be to add some kid friendly dishes and perhaps to invest in some new sheet sets. We loved the proximity to the pool of course and it was only a short walk to the white sand beach. We will be back for sure! Beach Umbrella/Chair Rental, Jet-skiing (rent on beach), Basketball Court (on site), Amusement/Water Parks, Shopping (Huge Outlet Mall nearby with Great Values! !, Sightseeing and much more!!!!!!!! !